Hiring a car while you explore all that Crete has to offer is probably the most convenient and cost effective solution. It enables you to get to see all the sights in your own time, including the hidden and off the beaten track sights. Crete is brimming in history, culture and natural beauty and while there is ample public transport, hiring a car gives you the freedom to go where you want, when you want in a well maintained, serviced and comfortable car that matches your travel budget. When you’re looking for car hire companies in Crete you will be welcomed by local car rental companies, such as ourselves at Rental Center Crete and you will also be faced with car hire brokers. There are differences to using local companies that have been operating in Crete for years and brokers, who work with a number of car rental companies. The advantages associated with using a local company range from the personalized service you receive to delivery and collection of the rental vehicle. Using a local company you can learn all there is to know about the company before you make your booking. Most companies these days offer free collection and delivery of the vehicle either to the airport or hotel as an added convenience, you will also be given a choice of vehicles to choose from, so you can search based on the number of people in your travel party, your budget and how much you want to spend on fuel. Depending on the local car hire company you choose, you will be given insurance. Usually insurance is included in the price, but be sure to look for companies that provide complete coverage with a NO EXCESS policy. This is an added convenience that can save you an astronomical amount of money should the vehicle be stolen while you’re out exploring or should you be involved in a road traffic accident. In addition to this, the advantage of using a local car hire company is that there are no hidden costs, no booking fees and no unexpected extras added to the price when you least expect it. If you have chosen a car on a daily basis, it should come with unlimited mileage and you pay for fuel. Watch out for companies that charge a mileage charge on top, this can soon boost up the price much higher than anticipated. Finally, the last benefit to choosing a local car hire company is that your full payment can be made in advance online or you can pay at the location on arrival, which is always an advantage once you’ve ensured the vehicle is what you booked. When you’re searching for car hire companies in Crete, you will also be faced with a number of car hire brokers. In some cases you may not realize they are brokers. Brokers don’t have their own company, but rather deal with a number of car rental companies in the local area to provide their customers with an extensive range. This means that you have no idea where your vehicle comes from, if it is well-maintained and serviced. Insurances: You will never see a clear insurance policy. If you do, check for smaller letters in the “Terms & Conditions” page. If full insurance is included, why offer additional insurance from a third company? Difficult Insurance claiming procedures. In the event of an accident, you have to pay for the damage repairs to the rental car company. Then, a hard procedure of collecting pictures, police reports, spare parts invoices etc. follows, in order to get the money paid to the rental company. After that, you have to pray to get your claim accepted. Beware of the obligation to prepay a full tank. You are not obliged to do that. Or at least not with their petrol pricing. Even though, most international companies are advertised as partners, you will, probably, end trying to find a small company without any online presence to get your car. Are you ready for that? Wide car group categories! Look carefully the car categories offered. You can’t compare a VW Golf or a Toyota Auris with a Hyundai Accent? You can not offer a VW Polo at the same price with a Kia Picanto! Can you? These differences grow as the groups getting bigger. Brokers work on commission and often charge a booking fee, which adds some hidden costs to the price. While they may be cheaper than the local car hire companies in some instances, once you start adding on all the hidden charges, you soon find you are paying more for your car rental than anticipated. Another thing that brokers will require is payment in advance, they don’t often provide you with the added advantage of paying at the location when you receive your vehicle. 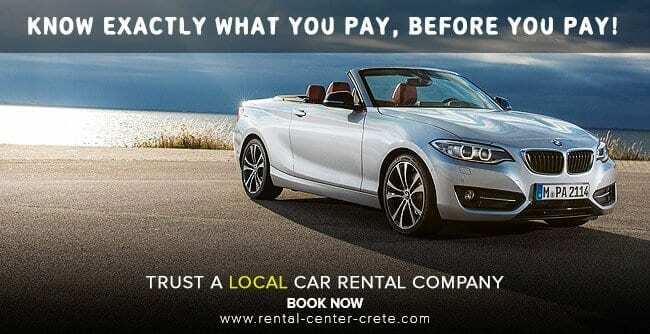 Rental Center Crete is a local car hire company based in Heraklion Crete, with vehicles in over 33 locations all across Crete's island. We efficiently provide low cost rental vehicles to people who need a car while vacationing in Greece's largest island, Crete. We offer “all inclusive” prices with “no hidden” costs and fully comprehensive insurance & 0-Risk terms.